Fernandinho, one of Manchester City’s most tactically important players, is approaching his 34th birthday, and will surely need to be replaced in the near future as his age catches up with him. Manchester City are still competing in 4 competitions, so having a heavy tactical reliance on a 33-year-old may be a risky move. The Brazilian international, who joined Manchester City from Ukrainian powerhouse Shakhtar Donetsk in July 2013, has had a resurgence under Pep Guardiola, becoming arguably one of the world’s best defensive midfielders. His aggression, superb passing ability, and exceptional reading of the game make him imperative to Pep Guardiola’s tactics. So it’s no wonder that Manchester City have lost every Premier League game without him. So, how do you replace Fernandinho? Pep may have already found a potential replacement in the from of 21 year old youth academy graduate Philippe Sandler, he’s much more of a centre back but has the passing ability to be converted into a defensive midfielder. The Dutch youth international has recently been made a part of Manchester City’s Champions League squad, but he may lack the first team experience needed. Both John Stones and Ilkay Gündoğan have both been played in that position during Fernandinho’s absence, but Pep Guardiola may have to look elsewhere as the pair have looked unconvincing in that role. Tanguy Ndombélé is a promising young defensive midfielder that was part of the Olympique Lyonnais side that beat Manchester City at the Etihad in the Champions League earlier this season and is young enough for Pep Guardiola to mold him into a suitable replacement. Lyon’s manager, Bruno Génésio, had this to say about the talented French international. “He’s interesting because he’s one of those players capable of solving tactical problems with his game intelligence”. Intangible assets such as tactical intelligence and game reading are crucial for any player who may potentially replace Fernandinho. Wolves’s star Ruben Neves has impressed this season but may lack the athleticism needed for the Fernandinho role, but like Tanguy Ndombélé, is also young enough at 21 to adapt to a more physical role. Young German international Joshua Kimmich has worked under Pep before at Bayern Munich and is only 23, but has already shown the maturity of his predecessor Phillipp Lahm. Or, a more far fetched option would be N’Golo Kanté, it goes without saying how hard it would be to get him to swap Stamford Bridge for the Etihad, but you can never never rule out Manchester City in any transfer negotiation. Their financial ability coupled with Kanté being played out of position under Sarri might just make an implausible move a more feasible option. He is a bit older though, (28 in March) but most consider him to be the world’s best defensive midfielder. His seemingly endless stamina and world class ball-winning ability would make him a perfect replacement. All of these players would be very pricey to obtain but if Manchester City are serious about replacing Fernandinho they will have to splash the cash to secure a long-term replacement. Pep, however, may be attempting to delay the decline of Fernandinho by employing him in a new, more passive role. In Manchester City’s 3-1 home victory against Arsenal, Pep Guardiola showed his tactical flexibility, deploying Fernandinho in a similar role to how Pep often played Busquets during his tenure at the Camp Nou. City lined up in an unorthodox 3-2-4-1 in possession, with Aymeric Laporte and Kyle Walker splitting very wide to defend the wide areas of the pitch. Otamendi stayed in a more traditional centre back position. Walker and Laporte were pivotal in maintaining possession for the home side, with the pair completing the 1st (Walker with 75) and 2nd (Laporte with 74) most passes. Ahead of them was a midfield double pivot consisting of Fernandinho, playing in a more familiar defensive midfield position alongside Gündoğan. The pair were tasked to provide cover and passing options for the isolated Nicolas Otamendi. Out of possession, Fernandinho dropped into the right centre back position creating a back four. Gündoğan maintained his position and Kevin De Bruyne replaced Fernandinho to recreate the double pivot mentioned earlier. Fernandinho wasn’t as aggressive in tactically fouling the opposition players to prevent counter attacks as he usually is, that responsibility was handed over to De Bruyne and David Silva (4 & 3 fouls respectively) compared to Fernandinho’s 1. All of David Silva’s and De Bruyne’s fouls were committed in the midfield, which reflects that instead of tracking back they preferred to foul to prevent potentially dangerous transitions. 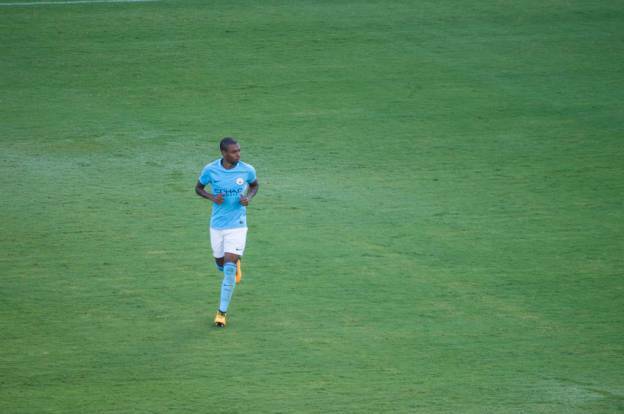 Will Pep be forced to gradually move Fernandinho back to elongate the Brazilian’s career as Manchester City look to replace him?